The Old Cathedral Library & Museum is open from Memorial Day through September 1, Monday through Friday, from 12:30 to 4:00 p.m. Families and groups wishing to see the Museum outside of the regular hours and/or dates should contact the library at (812) 882-5638, or the Vincennes and Knox County Convention and Visitors Bureau at 1-800-886-6443 or, if outside of the toll-free calling area, 1-812-886-0400. The Old Cathedral Library & Museum is located at the rear of the courtyard behind the Old Cathedral, at 205 Church St. Admission to the museum is on a donation basis. Those desiring admission to the library for reading and/or research purposes should contact the library for policies and procedures regarding reading room access. The Old Cathedral Library is the oldest library in the state of Indiana, and contains between ten and twelve thousand rare volumes. The oldest document in the collection is a Papal Bull issued by Pope John XXII, dated 1319. 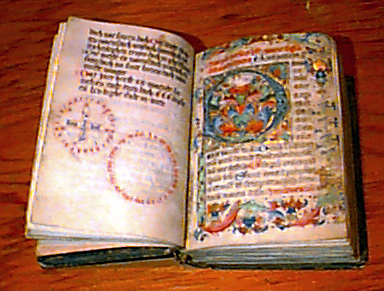 The oldest book is a 13th century illuminated manuscript volume on vellum of the Officium Sanctae Mariae, while the oldest book printed using movable type is Michael de Carcano's Sermonarium triplicatum, printed in Venice in 1476. Roughly 60% of the titles are in French, 25% are in Latin, and the remaining 15% are in other languages. Officium Sanctae Mariae showing Illuminations. 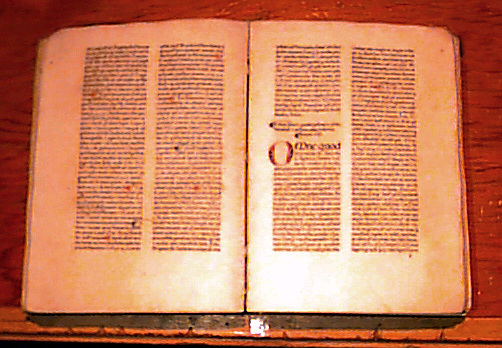 Sermonarium Triplicatum, printed in 1476, among the library's incunables. Simon Gabriel Bruté de Remur was a remarkable person by any measure. Born to a family of high position, his mother's first husband had been printer to French royalty. When his own father died while he was still a child, his mother supported the family by reviving her first husband's printing business, and young Simon spent many hours working as a compositor and typesetter in the family business. It was here that he probably developed his life-long love of fine printing, fine binding, and books in general. He made his mark as a scholar, having graduated first in his class of 1100 from the School of Medicine in Paris in 1803. He was offered a position in Napoleon's "First Dispensary," but turned it down, deciding instead to enter Seminary and study for the priesthood. He was ordained in 1808 and was offered service in the "Emperor's Chapel," but again refused, instead joining the Sulpicians and was sent to the seminary at Rennes to teach. Reverend Bruté came to the United States in 1810, at the urging of the Right Reverend Benedict Joseph Flaget, then Bishop of Bardstown, Kentucky. Bruté taught philosophy at St. Mary's Seminary in Baltimore, Maryland until 1812, at which time he was transferred to Mt. St. Mary's in Emmitsburg, Maryland, a petit seminaire that purposed to prepare young men for the study of theology preparatory to their entering the grande seminary. He taught philosophy there as well, and served as Vice President. It was at Mt. St. Mary's that he met Elizabeth Seton, founder of the Sisters of Charity, and, being her confessor during this period, established a warm and deep, life-long friendship with her. One of Mother Seton's two personal Bibles -- the one that she held at her death -- came to Bishop Bruté, and remains in the collection to this day. The Rev. Bruté served as President of St. Mary's Seminary in Baltimore from 1815 to 1818. At that time he was asked to return to Mt. St. Mary's in order to improve that institution's status from a preparatory school to a college and seminary. Then, on May 6th, 1834, he was appointed Bishop of Vincennes. He received the bulls from Pope Gregory XVI on July 22nd, left Emmitsburg on September 15th, was consecrated in St. Louis on October 28th, and installed in Vincennes as first bishop on November 5th, 1834. He had been here for nearly a year before his books were floated down the Ohio River on a flatboat, then hauled overland by wagon to Vincennes. The original library building was erected in 1840 by Bishop Celestin de la Hailandiere, served as St. Gabriel's College and the diocesan seminary, and still stands between the Old Cathedral and the Rectory. The present building was dedicated on the 18th of May, 1969, and was made possible by Eli Lilly and the Eli Lilly Endowment of Indianapolis. Less than 10% of the entire collection is on display at any one time. The remainder are stored in an air-conditioned vault on the lower level. Funding is presently being sought to build an addition onto this building so that all books can be moved upstairs, where they can be viewed by the public while still being kept safe and secure in a humidity-controlled environment. The only permanent exhibit is the small floor case containing the Bible left to Bishop Bruté by Elizabeth Seton, the first U.S.-born saint. All other cases -- the wall cases and the larger floor cases -- feature special displays. The life-sized statue of Bishop Bruté is hand-carved of laminated Canadian walnut. It was made in the Province of Quebec by Pierre Bourgault. The hand-carved desk was a present to Bishop Maurice de St. Palais, is over one hundred years old, and is called a standing or sitting desk, since it can be used either way. You may be interested in links to other Catholic library resources in what's known as the Old Northwest Territory.